The Italian for enter, is the regular -ARE verb entrare. ... imagine you ENTER a RARE pyramid. Entrare is a regular -ARE verb conjugated like thousands of other -ARE verbs. Conjugate this and you'll be able to conjugate other -ARE verbs. entrare can also mean: to come in, to go in, to get in, to access; to tackle (sport). - entrare in politica (v): to go into / to enter politics. - entrare furtivamente (v) : to sneak in. - la entrata (nf) : entrance, entry; admission; income; tackle (sport). Get Italian words embedded in your mind using proven techniques like Cartoon Memory Triggers. To remember a word, just think of the pic! 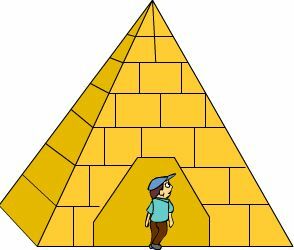 Imagine you ENTER a RARE pyramid. non entrare! (non) entri! (non) entriamo! (non) entrate! (non) entrino! ✔ Entrare is a regular -ARE verb, these being the most common verbs in Italian. ✔ Learn entrare and it will reinforce the pattern for ALL those other -ARE verbs. ✔ You can more easily remember words and verbs like the Italian for enter entrare using the techniques of the world's Memory Masters. 200 Words a Day! Free Daily Italian Lesson Online - the verb in Italian for enter, is entrare - fully conjugated. Italian Learning Made Fun and Fast with your free Daily Italian Verb Lesson - entrare.